Tags: Bridesmaids, Deep Red, Heavy, Nikah & Engagement, Straight Trouser. Deep red pure chiffon shirt has been endowed with elevated embroidery on bodice finished with sea green piping on round neck sleeves line and slits. Embroidery on bodice is looking so antique. 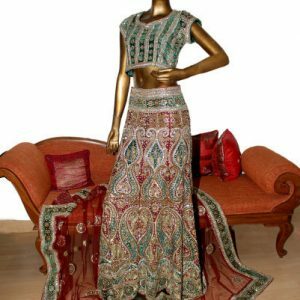 Embellishment includes kora, dabka, beads, stones, sequins and copper tilla work. Beautiful ornamental antique motifs are sprayed all over the front. 100% handmade embellishment. Deep red raw silk trousers. Plain deep red pure chiffon dupatta with sea green piping on edges.